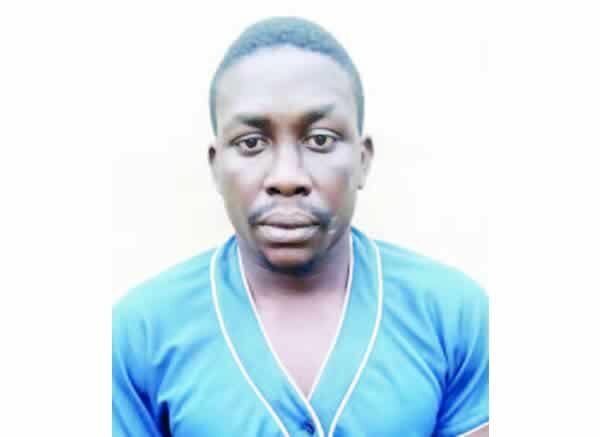 The Inspector-General of Police Special Intelligence Response Team has arrested a suspected bank robber, Olatunde Adetunji, in the Isolo area of Lagos State. A trader, Bashirat Akinmushire, aka Area Mother, who allegedly kept weapons for Adetunji and his gang members, was also arrested by the police team. Both Adetunji and Akinmushire were said to be members of the Eiye Confraternity. PUNCH Metro learnt that the gang specialised in robbing bank customers in the Ikeja and Isolo areas. The suspects were alleged to have recently attacked and dispossessed a woman on her way to depositing money in a bank at Opebi, Ikeja. Adetunji was reportedly arrested a few days later when the woman allegedly sighted him on Toyin Street, Ikeja. She was reported to have raised the alarm as operatives of the IRT, who raced to the scene, apprehended the 31-year-old. The suspect, during interrogation by the police, allegedly confessed that members of his gang usually carried out robberies and cult killings in the Ikeja and Isolo areas. Adetunji also allegedly said the guns they used during operations were kept with Akinmushire. A police source told our correspondent that the suspect led detectives to a market on Jakande Low Cost Housing Estate, Isolo, where Akinmushire was arrested. However, the trader reportedly claimed to have passed the weapons to another member of the gang, identified only as Junior, aka Jungle. “When she was asked to take the operatives to Junior’s house so he could be arrested and the weapons recovered, she misled the policemen and took them to a wrong location, where she also attempted to escape. “She ran into a ditch in the process and sustained serious injuries, which made the policemen to stop their search and take her to a hospital,” the source said. Adetunji said his gang usually paid Akinmushire N5,000 to keep weapons for them. He said, “I am a member of the Eiye Confraternity and I joined the cult while at a university in Ogun State. When I dropped out, I came back home to join members of my cult on Jakanda Estate and I discovered that they had already procured an AK-47 rifle and a revolver pistol. “They told me that they bought the guns from a soldier and they usually kept them at Area Mama’s shop, who is also a member of our cult. She normally hides the guns at the back of her shop where she sells pepper and tomatoes. Akinmushire, in her statement to the police, said the gang forced her to keep the weapons because she was a member of their. The mother of three said she did not know what the gang did with the guns. She said, “Sometime in February 2016, Olatunde (Adetunji), Junior, and their friend started brining one Ghana-must-go bag containing some items which I did not know the content, to my shop. They usually bring the bag for me to keep for them. “Initially, I did not know the content, but I asked them what was in the bag and they told me. They said I should not disclose it to anybody. Each time they came to pick the bag, they gave me N5,000 or more. I asked them what they were using the guns for, but they said it was none of my business. The Force Spokesperson, Jimoh Moshood, had yet to respond to an enquiry sent to him as of the time of filing this report.